The DPRK held a series of cultural events and meetings during February 10 to February 16 to mark the Day of the Shining Star, or birth anniversary of late DPRK leader Kim Jong Il (Kim Cho’ng-il). The Chongbong Band of the Wangch’aesan Art Troupe performs at Ponghwa Art Theater in Pyongyang February 16, 2016 (Photos: KCNA). The Mansudae Art Troupe performs at East Pyongyang Grand Theater on February 16, 2016 (Photos: KCNA). Synchronized swimmers perform at the Ch’angkwang Health Complex in central Pyongyang on February 15, 2016 (Photos: KCNA). On February 15 (Monday) the Ministry of Land and Marine Transport, along with athletic groups and social organizations, gave a performance of synchronized swimming at Ch’angkwang Health Complex in central Pyongyang. Kim Jong Il generally shunned many public activities on his birthday, however he usually attended this event even if his presence was not always reported in state media. Attending the synchronized swimming were Yang Hyong Sop (Vice President of the Supreme People’s Assembly [SPA] Presidium), various officials of the government and social organizations, foreign diplomats stationed in Pyongyang, and various Koreans visiting DPRK. Synchronized swimmers perform at Ch’angkwang Health Complex on February 15, 2016 (Photo: Rodong Sinmun). The annual Kimjongilia Festival (Photo: Rodong Sinmun). The Kimjongilia Festival opened on February 15 (Monday) with various displays of the KJI flower cultivated and arranged by Workers’ Party of Korea [WPK], Korean People’s Army [KPA], DPRK Government and social organizations, as well as floral displays subsidized by Chosen Soren (Chongryo’n; the General Association of Korean Residents in Japan), overseas Korean and DPRK friendship organizations and foreign embassies and businesses in the DPRK. Opening day of the Paektusan Prize International Figure Skating Festival at Pyongyang Ice Rink on February 15, 2016 (Photo: Rodong Sinmun). The annual Paektusan Prize International Figure Skating Festival opened at Pyongyang Ice Rink on February 15 (Monday). In attendance were officials of the Ministry of Physical Culture and Sports, Pyongyang citizens, DPRK students, foreign diplomats stationed in Pyongyang, foreign defense attaches stationed in Pyongyang and various foreign guests. The ice skating festival includes figure skaters from the DPRK, Russia, Latvia, Belarus and Canada. It included routines set to “The General Will Always Be with Us,” “A Dear Nam,” “The Sound of a Horse’s Hooves in Mt. Paektu,” “Our Father” and “The General Star Beyond the Cloud.” Minister of Physical Culture and Sports Ri Jong Mu “expressed belief that the festival to be held in the idea of independence, peace and friendship would bring joy to the Korean people” during his opening ceremony speech. Stamps released on February 12, 2016 depicting the four highest state awards named after late DPRK leader Kim Jong Il (Photos: KCNA). The DPRK Stamp Bureau released four new stamps to commemorate the Day of the Shining Start on February 15. The stamps show the state awards named after Kim Jong Il: Order of KJI; KJI Prize; KJI Youth Honor Prize; and KJI Children’s Honor prize. February 17, 2016 performance of Rosy Future of My Homeland Under the Blessings of Feburary at the Pyongyang Grand Theater (Photos: KCNA). In one photo released of the performance by Korean residents in Japan, KCNA used a similar image of a dancer with an ogum that looked similar to a famous image of Kim Jong Un’s mother, Ko Yong Hui, an ethnic Korean born in Japan (Photos: KCNA, NK Leadership Watch file photo). A concert by art troupes of DPRK Cabinet ministries and state commissions at the People’s Palace of Culture on February 12, 2016 (Photos: Rodong Sinmun). A concert by the art propaganda squad of the Kim Il Sung Youth League at the Central Youth Hall in Pyongyang on February 12, 2016 (Photos: KCNA). A loyalty meeting and fireworks display near KJI’s official birthplace in Mt. Paektu near Samjiyo’n County, Yanggang Province on February 12, 2016 (Photos: Rodong Sinmun, KCNA). 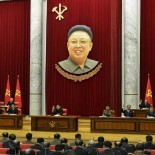 The annual loyalty meeting held at Mount Paektu near Samjiyo’n occurred on February 12 (Friday). Attending the meeting were General Pak Yong Sik (Minister of the People’s Armed Forces), O Su Yong (WPK Secretary of Light Industry) Kim Tok Hun (DPRK Vice Premier), Jon Yong Nam (Chairman of the Kim Il Sung Youth League Central Committee) and various officials and functionaries of the WPK, KPA, DPRK Government, officers and members of the Paektusan Youth Shock Brigade and officials of the Yanggang Provincial People’s Committe, the Yanggang WPK Provincial Committee, Samjiyo’n County People’s Committee and the Samjiyo’n County WPK Committee. Meeting participants “renews their pledge to hold the leader high in esteem as the sun of Chuch’e and accomplish the revolutionary cause of Chuch’e under the leadership of Marshal Kim Jong Un. Ice sculptures in Samjiyo’n County (Photo: Rodong Sinmun). After the speeches there was a fireworks display. Samjiyo’n County also hosts an annual ice sculpture festival around KJI’s birthday. This year, over 1,000 ice sculptures were created by the Ministry of People’s Security Construction Shock Birgade #618. Themes at this year’s ice sculpture included “As the Eternal Sun of Paektu, “Our Brilliant National Heritage” and ice sculptures on display depicted festival lanterns, snow caves, a crystal bridge, the Kwangmyo’ngso’ng-4 satellite and the Paektusan Hero Youth Power Station. Agricultural employees and Union of Agricultural Workers of Korea [UAWK] met at Wo’nhwa Cooperative Farm in P’yo’ngwo’n County, South P’yo’ngan Province on Feburary 12 (Friday). UAWK Central Committee Vice Chairman Han Kyong Song delivered a report which was followed by speeches. According to KCNA the report and speeches said that “the revolutionary life of Kim Jong Il was the one of a peerlessly great man who explored an untrodden path, built a powerful nation to prosper along with Mt. Paektu and added glory to it. Kim Jong Il developed the Workers’ Party of Korea into the party of President Kim Il Sung and put the country on the status of an invincible politico-ideological power, world’s military power and nuclear power.” The report and speeches “called upon all the members of the union and agricultural workers to take the last instructions of Kim Jong Il as a lifeline, unconditionally implement them, firmly equip themselves with Kimilsungism-Kimjongilism” and for “fulfilling the grain production plan without fail through a more brisk socialist emulation and thus greeting the Seventh Congress of the Workers’ Party of Korea as a glorious one of victors. Korean Democratic Women’s Union Central Committee Chairwoman delivers a report at a KDWU meeting in Pyongyang on February 11, 2016 to mark the birth anniversary of late DPRK leader Kim Jong Il (Photos: KCTV screen grabs). View of participants at a February 11, 2016 Korean Democratic Women’s Union meeting to mark the Day of the Shining Star (Photo: Rodong Sinmun). WPK Secretary Kim Ki Nam and senior cultural affairs officials attend the opening of a pencil sketch and visual arts exhibition on February 11, 2016 (Photos: KCTV screen grabs). DPRK citizens visits a pencil sketch and visual art exhibit in Pyongyang (Photo: Rodong Sinmun). The Sixth National Pencil Drawing Festival opened at the Pyongyang International House of Culture on February 11 (Thursday). The festival displayed 350 pencil sketches divided between amateurs and professionals consisting of DPRK visual artists, school children and KPA service members. Sketches and art works displayed depicted “the three commanders of Paektu” (KIS, KJI and Kim Jong Suk” and portrayed “the reality of the DPRK enjoying all blessings of socialism under the guidance of Marshal Kim Jong Un.” Kim Ki Nam attended the opening ceremony along with officials involved in culture and arts and Pyongyang citizens. WPK Secretary Kim Ki Nam and SPA Presidium Vice President Yang Hyong Sop visit a photo exhibition on KJI’s revolutionary history at the People’s Palace of Culture in Pyongyang on February 11, 2016 (Photos: KCTV screengrabs). DPRK citizens visit a photo exhibition on KJI at the People’s Palace of Culture (Photo: Rodong Sinmun). A photo exhibit of Kim Jong Il’s various public activities, on-site visits and military field inspections entitled “The Whole Life for People” opened at the People’s Palace of Culture on February 11. Attending the opening ceremony were Kim Ki Nam, Yang Hyong Sop and various party and government officials. According to KCNA the exhibit had photos which “showed the personality of the brilliant commander of Mt. Paektu who developed the Korean People’s Army into the powerful elite revolutionary army,” that “deal with the effort of Kim Jong who devoted his all to the prosperity of the country and the people’s happiness” and those “dealing with the revolutionary obligation of Kim Jong Il who boundlessly respected the revolutionary forerunners and feats he performed in firmly carrying forward the revolutionary cause of Chuch’e and So’ngun (military-first) and providing the eternal foundation for the prosperity of the country.” The exhibit also included photographs of Kim Jong Un and his leadership activities. Concert by DPRK university choirs held at the People’s Palace of Culture in central Pyongyang on February 10, 2016 (Photos: KCTV screen grabs). This entry was posted on 02/16/2016 by nkleadershipwatch in 2016 Day of the Shining Star (KJI Birthday).